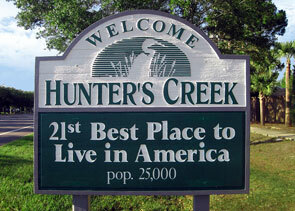 In 2011, CNN/Money and Money magazine ranked Hunter's Creek 21st on their list of the 100 best places to live in the United States. Criteria included financial, housing, education, quality of life, leisure and culture, and weather data. Recreational activities in Hunters Creek includes After school program, Basketball, Bingo, Hiking and biking trails, Kids camp, Kids Night Out, Kindermusik, Senior social, Soccer (HCSC), Tennis, Volleyball, Yoga and other activities.